Im just going to get right into this one, because I'm too busy constantly eating it. On everything. I will say this.... it needs about 12 hours in the fridge to set before consuming. Depending on the jalapeños, it is much hotter/spicier before setting. It eventually becomes a bit milder (but not at all MILD), a thicker consistency, and way more flavor is built up, after some fridge time. I'd put this up against store bought sriracha any day. It is certainly as addictive, or more so. Disclaimer: Spicy addicts! Consume at your own risk! 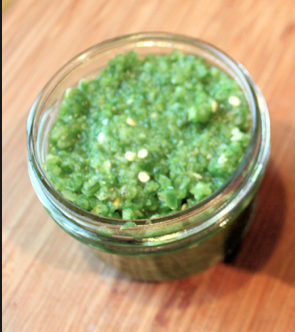 *For a milder sriracha, remove and discard jalapeño seeds before blending. Makes about a cup of sriracha. 3 medjool dates, pitted and chopped. Blend or process everything and scrape mixture into a glass jar. Refrigerate 12 hours to set, before serving. On everything. I've been feeling so inspired lately. Perhaps the beautiful landscape of our new city of residence, Sedona. It offers great hiking, rock climbing, beautiful views for photographic inspiration. What more can I ask for? It feels like home. As you may know, I've been experimenting more and more with raw "cooking". Eating fruits, vegetables, seeds, and nuts in their raw, natural state gives you tons of energy and vitality. A little creativity and lots of experimenting, has allowed me to create many raw dishes and desserts, that "seem baked". Meet my latest, Coconut Mango Pie. 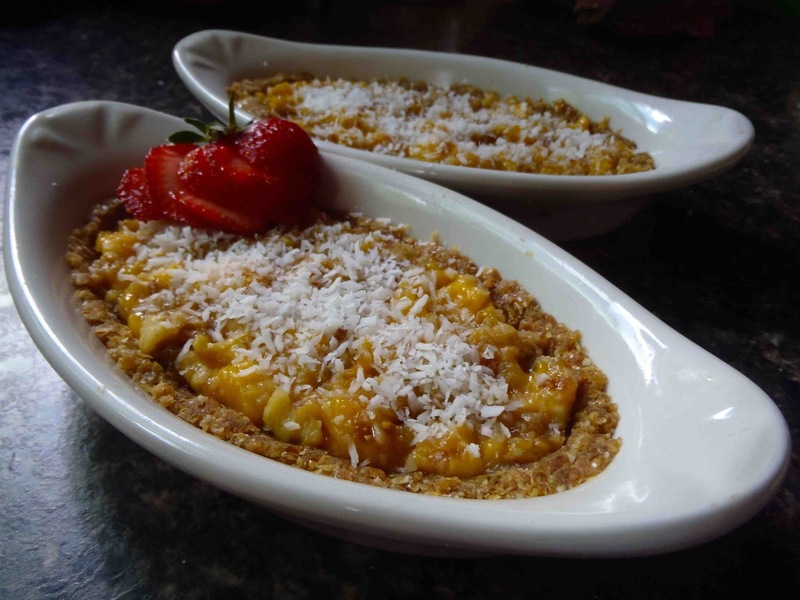 It's sweet, soft, ripe mango, mixed with walnuts and shredded coconut create a decadent pie filling, inside a nutty graham cracker-like crust. It's very fast and easy to prepare, and so guilt-free that you can eat a pie for breakfast if you want! Process all ingredients in a food processor, until a dense crumby consistency. Press into a small pie pan, or dish of choice. Don't need to clean the processor yet, leave the leftover crumbs to mix in with the sauce. In a small bowl, add sauce to filling and stir to combine. Spread mixture over the crust. Sprinkle more shredded coconut on top. Chill in the refrigerator at least 2 hours to set. Serve cold. *A mango is ripe when it has a little give, if you press on it with your finger. I've always kinda wanted to be a saucier. Making and tasting different sauces all day. Getting creative with different ingredients and my spice rack. Trying interesting new flavor combinations. Plus the title Saucier, sounds cool. Now I enjoy taking it a step further, and include vegan substitutions, recreating old saucy favorites. Both sauces below are gluten free, raw, oil free, soy free, and vegan. Either can be heated, if you like, but it's definitely not necessary, which is nice on a summer day, when it's too hot to light up the stovetop burners or the oven. Both sauces are very versatile and can simply be used as a salad dressing, a dip, a pasta sauce, or drizzled on a side vegetable. Possibilities are endless. Enjoy! *Both recipes contain nuts. 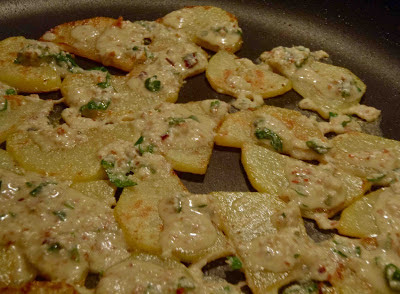 For a creamier sauce, it is recommended that you soak the nuts in water for a few hours before preparing the recipe, or substitute nut butter for the nuts. Put all ingredients except tomatoes in a blender or food processor. Blend/process until smooth. Add tomatoes and pulse to combine. 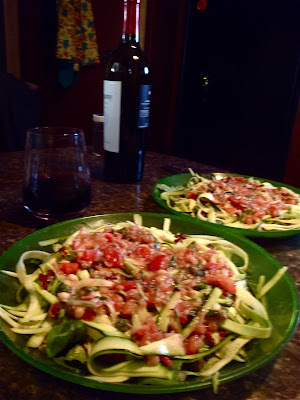 This sauce is excellent on some raw zucchini fettucini. If you don't have a fancy kitchen gadget, to cut the zucchini fettucini, you can use a regular old vegetable peeler. That's how we roll, here in this RV kitchen. (approx 1 large zucchini per person) Cut the ends off zucchini. With a vegetable peeler, peel zucchini lengthwise into long thin strips. 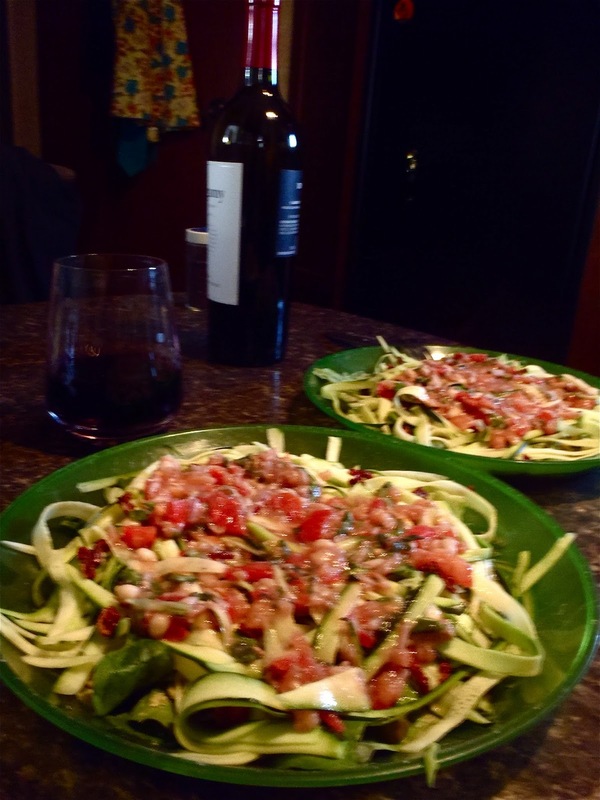 With a knife, trim strips lengthwise into fettucini widths. Do this right before serving, because they can get watery if they sit for awhile. Add all ingredients to a blender or food processor, blend until smooth. I went to visit my family in NJ recently, and whenever I do, I like to cook them all a big vegan feast. It can be tricky sometimes to come up with something that everyone will like. Especially children, in my case, because I like spices and bold flavors, most of my food is not the most kid friendly. But my neice and nephews would be joining us in the feasting, and I wanted to make sure I made something they would like too. So, I found a recipe for all natural vegan hotdogs made from....carrots. Wait! Stay with me now! I know I know, it sounds absurd. In fact, my brother, said something like, "If I knew you were going to serve me a carrot on a bun, I would have stopped at the hotdog stand on my way home." But the carrots are cooked and marinated in a perfect hotdoggy seasoned combination, they are sure to please all hotdog lovers (including my brother) and children! 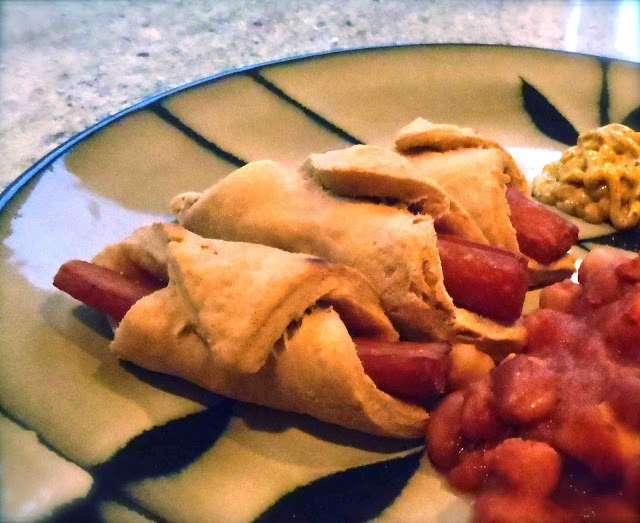 I altered the recipe slightly for some fun, I decided to go with my favorite hotdoggy party food, Pigs in a Blanket. The blanket is made with my light flakey whole wheat biscuit recipe. You need to try this! Prepare the hotdogs in advance. You will need a few hours to marinate them. For the original hotdog recipe click here. *Instead of bun length carrots, use baby carrots, or peeled carrots cut into thirds. I also substituted tamari for the coconut aminos. I've made these before substituting the coconut aminos with soy sauce or Braggs liquid aminos. They all work. Use what you have. In a large bowl, mix and breifly knead biscuit ingredients. Add more water if needed. On a floured surface, roll out dough to approx 1/4" thick. cut rolled dough into 3 inch squares (baby carrot length). Turn each square so a corner is on top & bottom, like a diamond. Lay a baby carrot on each diamond, top corner to bottom corner. Tuck the left corner over the carrot, under the right corner and press to seal. Lay each one on a sprayed baking sheet. Bake at 400º for 15-20 minutes or until golden brown. Serve with your favorite hotdog toppings. I highly recommend some spicy yellow mustard!